We celebrate this feast of unity between angels and humans, and this unity is not in the "life to come" at the end of times — it starts in this world: the angels direct and guard the sons of God who are struggling in this world; they are glad with every sinner returning to God; they convey prayers to God's throne. Hence, there is a common liturgical work between angels and humans. The angels offer a non-stop continuous doxology and mental worship with humans to God. They offer to the Holy Trinity the Trisagion: "With these holy powers, we sinners say the trisagion, 'Holy, Holy, Holy Lord of Sabaoth, the heavens and earth are filled with Thy glory, hosanna in the highest, blessed is He who comes in the name of the Lord, hosanna in the highest'." They gather around the holy altar with the priest to serve with him the Liturgy. So there is only one celebration, one feast common between humans and angels: "Angels with humans celebrate together, earthly with heavenly speak. "(3) "Through Thy Cross Christ our God, the angels and humans become one church, heaven and earth are united, O Lord glory to Thee. "(4) The angels are members of the Church, the body of Christ. The 8th of November is also a specific feast of Archangel Michael, going back in history in celebrating the memory of his church in Arkadia in Constantinople. From the book of Tobiah in the Old Testament, the Archangel Raphael reveals himself to Tobiah by saying: "I will not hide from you the mystery, when you were praying, you and Sarah, I was lifting your prayers to the Holy One … and now God sent me to heal your wounds … I am Raphael, one of the seven angels who lift the prayers of the saints and serve the Throne of the Holy One" (Tobiah 12:12-15). In this passage there is a description of the work of angels, which is mainly to lift the prayers of the saints and help God, and they are sent by God to humans to help them. "And of the angels he saith, whom maketh his angels spirits, and his ministers a flame of fire" (Hebrew 1:7). The word angelos is Greek and means "who is sent" or "messenger." This name is given to them by God because of the function of serving the human race to be saved: "Are they not all ministering spirits sent forth to minister for them who shall be heirs of salvation" (Hebrews 1:14). The Holy Scriptures do not mention exactly when the angels were created, but the Church in its holy tradition, through the writings of its holy fathers, chiefly St. John of Damascus, St. John Cassian, St. Basil the Great, St. Gregory the Theologian, St. Ambrose of Milan, St. Dimitri Rostov, St. Dionysios the Areopagite - all of them believe that they were created from "nothing" prior to the sensible material world and prior to humans. The angels were created by God to glorify Him and contemplate Him, "when the stars were created, all my angels were glorifying me and praising me" (Job 38:7). It is the Logos of God, Who created them because, "for by Him were all things created, that are in heavens, and that are in earth, visible and invisible, whether they be thrones, or dominions, or principalities or powers, all things were created by Him and for Him" (Colossians 1:16). The Seraphim are the highest rank, the closest to God. Seraphim is a Hebrew word meaning "fire," and it symbolizes the heat of their love of God. The Seraphim have six wings: "I saw the Lord sitting on a throne high and lifted up, and his train filled the temple, above it stood the seraphim: each one had six wings; with two he covered his face, with two he covered his feet, and with two he did fly, and one cried unto another, and said: 'Holy, holy, holy is the Lord of Hosts: the whole earth is full of his glory'" (Isaiah 6:1-3). Directly behind the Cherubim comes the Thrones, and they are the angels on whom God rests, as their name indicates. All these angels stand around God's throne in fear and great respect of His glory; they contemplate God and know His "energy" and not his "essence" (ousia), since they are creatures. They are in a continuous attraction (eros) and "ecstasy" to God, to the extent that they forget themselves. Every rank (and group) of angels, according to its closeness to God, partakes of the gifts of the Holy Spirit, the Spirit of wisdom and discernment, the Spirit of power and fear of God. Furthermore, their communion with the Holy Spirit is continuous. The angels do not have the feeling of jealousy and competition between them; they all have one will, which is to serve God; the angels of the lower ranks obey in love the angels of the higher ranks as if in obedience to God. The angels are also a "heavenly army." Their leader and head is Archangel Michael, who is one of the seven spirits in front of God's throne. "O Holy Archangel Michael glorified, God has placed you head of their Hosts, Powers, Angels and Archangels, Dominions, and Principalities" (Exapostolarion of the feast). 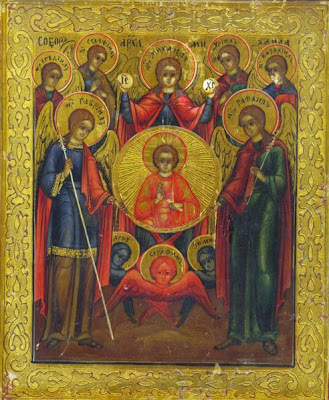 According to St. Dionysios the Areopagite, the angels were created as humans in the "image and likeness" of God. According to the "image" because they have an intellect (mind) that generates thoughts (ideas), and to the "likeness" because the angels are directed and attracted toward God. (9) St. John of Damascus says they are creatures limited in space and time; they have their own specific external appearance. Compared to humans, they are bodiless due to the human's "heavy body," but compared to God they have a body. "We speak about the angels as bodiless and immaterial compared to us, but in fact everything is heavy and material compared to God, to Whom nobody can be compared, because only the Divine is non-material and bodiless. "(10) He continues to say that, "God created the angels according to His own image and He created them weightless and with heat" in order to be attracted to Him and to serve Him. He adds: "The angel is always in motion, he has free will, gifted with an immortal nature. This nature is intellectual, thus he has a free changing will. "(11) The angels do not need a tongue or ears to communicate; they interchange thoughts, and their food is theoria. Finally, the place or "home" of angels is heaven, "in the third heaven where the archangels stand before the throne of God, surrounded by a countless heavenly army" (Isaiah 6; Revelation 4:5). First of all, this event happened before the fall of man. The cause of the fall of some angels is that they rebelled against God. Their leader was one of the most beautiful Cherubim; he was gifted much more than the others in divine grace, according to the prophet Isaiah: "How art thou fallen from heaven, O Lucifer, son of the morning! How art thou cut down to the ground, which didst weaken the nations! For thou hast said in thine heart, 'I will ascend into heaven, I will exalt my throne above the stars of God, I will sit also upon the mount of the congregation, in the sides of the north, I will ascend above the heights of the clouds, I will be like the Most High.' Yet thou shalt be brought down to hell, to the sides of the pit" (Isaiah 14:12-15). The prophet Ezekiel symbolizes the king of Tyre with the fallen Cherubim: "Thou sealest up the sum, full of wisdom and perfect in beauty, thou hast been in Eden the garden of God … Thou was perfect in thy ways from the day that thou has been created until iniquity was found in thee … therefore I will cast thee as profane out of the mountain of God, and I will destroy thee, O covering cherub, from the midst of the stones of fire … I will cast thee to the ground" (Ezekiel 28:12-18). This fall was as fast as the lightning described by the Lord Jesus Himself in the Gospel of St. Luke: "I beheld Satan as lightning fall from heaven" (Luke 10:18). This fallen Cherubim attracted to him a number of angels of different ranks, some from the higher ranks, and he took them with him. They were expelled from paradise, so they wandered on earth. The Archangel Michael resisted the devil rebeller and his companions, and a war happened in heaven. "Michael and his angels fought against the dragon; and the dragon fought with his angels, and prevailed not; neither was their place found anymore in heaven" (Revelation 12:7-8). As St. Ignatius Brianchaninov describes it, "The devil carried with him one third of the angels and threw them on earth." Then, the Archangel Michael cried in a loud voice, "let us attend" in order not to fall with the devil and his angels. He did not dare to judge the devil, he just demanded attention and vigil once, and from that time the relation between the angels loyal to God got stronger by grace and they were not subject to evil. From that time, there is a strong war between the angels loyal to God and the devil and his angels. All the gifts that were for the demons were turned to evil. The devil was called "Satan," a Hebrew word meaning "enemy," which parallels the Greek word diabolis, which means "divider." The word demon is Greek and means "the fallen angel." St. Ignatius Brianchaninov describes that, before the fall of Adam, the devil was wandering the sky having within him a feeling of great emptiness. God allowed him by His great compassion and mercy to enter the paradise of Eden in order to contemplate its beauty and give him a chance to repent. But he was jealous of Adam and Eve, and tried with all his force to cast them out of paradise, and succeeded in casting Adam and Eve out of paradise and even bringing them under his control. In that way the devil lost every hope of coming back to God. From the instance of the fall of man, there is a great conflict within the human person between the angels of light and angels of darkness. The angels of light were sent by God to help the humans even from the era of the Old Testament. We see the Archangel Gabriel in charge of Israel when they left Egypt, Archangel Raphael helping Tobit, Michael sent to help Joshua the son of Nun, and arguing with the devil regarding the body of Moses. However, the devil was always trying to make humans sin, but without knowing he is doing the will of God, because every evil ends always with goodness. The devil, then, became an instrument of God's trial to men. "Are they not all ministering spirits, sent forth to minister for them who shall be heirs of salvation" (Hebrew 1:14). St. John Chrysostom comments on this verse by saying, "Look how God loves man so that He created holy creatures to serve the man created according to His image." Humans, although heavier than angels by their body and in a state of sin, death and corruption, when they are deified become higher than the angels in divinity and holiness. "What is man, that thou art mindful of him? And the son of man, that thou visited him? For thou hast made him a little lower than angels, and hast crowned him with glory and honour" (Psalm 8:5-7). The example of this is the Theotokos, the Mother of God, who became "more honorable than the cherubim and beyond compare more glorious than the seraphim." The devil is jealous of the rank man took after the incarnation. St. Gregory of Nyssa says, "Angels kneel in front of every man who is born again and celebrate the return of men to the original grace through the Newborn, because they are glad for every man who is saved from sin. This gladness of angels will not be complete until the second coming of Christ, for which the angels are waiting." "For He shall give his angels charge over thee, to keep thee in all thy ways" (Psalm 90:11). The major work of angels is to praise God, but their partial work is to guard humans and the universe that surrounds humans. The Holy Fathers mention many cases in the Old and New Testaments about angels helping humans. For example, when St. Peter was delivered from prison, it was said: "This is his angel" (Acts 12:15). St. John Chrysostom says that "for every one of us has his angel;" St. Basil the Great adds, "Beside every believer in God, sits his angel, so repent." Finally the angel of prayer is the angel who helps us to pray. St. Clement of Alexandria says, "Even when a person prays alone, he is accompanied by angels." Tertullian commands the Christian not to sit when he prays in respect for the angel of prayer standing beside him. Archangel Raphael is one of the seven angels who "carry the prayers of the saints to God" (Tobiah 12:15). Origen writes, "Angels gather close to the person praying to be united to his prayer. Moreover, each angel contemplates the face of the Father in Heaven and prays with us and works for us for all our needs." The angels have a major role in the spiritual life of each person. First of all, they convey all the spiritual gifts to the person and this according to their rank and depending on the person's spiritual stage: purification, illumination or deification. "The more we purify ourselves, the more we know God, and the more we love Him" (St. Gregory the Theologian). The spiritual person resembles the angels, as St. Gregory of Nyssa says: "The spiritual life allows the spirit to enter the world of angels." During the purification stage, "We need an angel to help us overcome our passions, since we are not perfect," according to Origen. In the illumination stage, the soul enters the angelic world, to attain finally a life of union with God. The angels contemplate how the soul moves out of the darkness of sin to a state of illumination and grace and passes them over to the glory that the Logos granted to humanity only in His union with human nature. The angels wait for a deified person to be united to his prayer and be lifted up more towards God. That is why, "The angels wait for the death of martyrs to lead their souls to its place," says St. Gregory of Nyssa, and "they surround the martyrs on their way to God and they accompany them to the holy of holies where the Holy Trinity is in the middle of Cherubim and Seraphim," confirms St. John Chrysostom. What prohibits us from living like angels, if the angelic life is granted for every true sincere faithful member of the Church? Many people ask why they cannot see angels, and why the angels do not help them, but they do not question if they are really free from the passions that darken the soul and the heart. The main goal is to free ourselves from passions. We must ask of God for an angel of peace, who will direct and protect our life and spirit and body. Through the intercessions of our Holy Angels, may our God enlighten us and save us. Amen. 5. St. Ignatius Brianchaninov, "Homily on Angels," Periodical No. 14, Archangel Michael Monastery, Lebanon. All quotations of the Holy Fathers from St. Ignatius are without references. 6. St. John of Damascus, "Homily on angels and demons," Periodical No. 2, Archangel Michael Monastery, Lebanon. 8. St. Ignatius Brianchaninov, "Homily on Angels," Periodical No. 14, Archangel Michael Monastery, Lebanon. 10. St. John of Damascus, "Homily on angels and demons," Periodical No. 2, Archangel Michael Monastery, Lebanon. 13. St. Ignatius Brianchaninov, "Homily on Angels," Periodical No. 14, Archangel Michael Monastery, Lebanon. 14. St. John of Damascus, "Homily on angels and demons," Periodical No. 2, Archangel Michael Monastery, Lebanon. 15. St. Ignatius Brianchaninov, "Homily on Angels," Periodical No. 14, Archangel Michael Monastery, Lebanon. 17. Taken from "Les anges et leur mission, d'apres les peres de l'Eglise," Chevetogne, Jean Danielou; Periodical No. 8, Archangel Monastery, Lebanon. 18. Periodical No. 7, Archangel Michael Monastery, Lebanon.